Why, you ask? Because the sweet "Yaranaika?" t-shirt my podcasting pal shidoshi bought me while in Japan late last year finally is in my grubby little hands. Hopefully you can make out enough of it to see that the shirt bears the same image found on this blog's header. 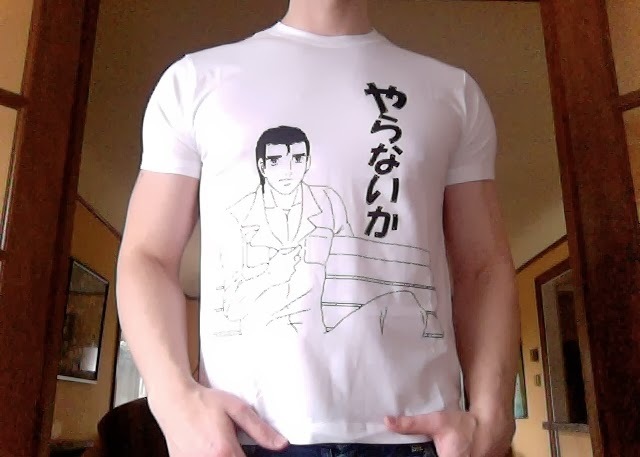 In case I haven't said it before, the text on the shirt is Japanese for “shall we do it?” and it comes from a rather dirty--and gay--manga called Kuso Miso Technique that was first published back in 1987. Beautiful! I love that! What a perfect gift. Ha, Shidoshi? There's a name I haven't heard in a while. How do you know him? Thanks, Justin! To be honest, though, it wasn't a gift. It was bought for me and I'm supposed to pay shidoshi back, although the two of us have yet to fully work out the details. Regardless, I think it's awesome! I've known shidoshi via Twitter for ages now, or so it seems. About a year or so ago, though, we came together with Anne of Chic Pixel -- http://www.chic-pixel.com/ -- and started an on-and-off podcast called The Nichiest Podcast Ever.